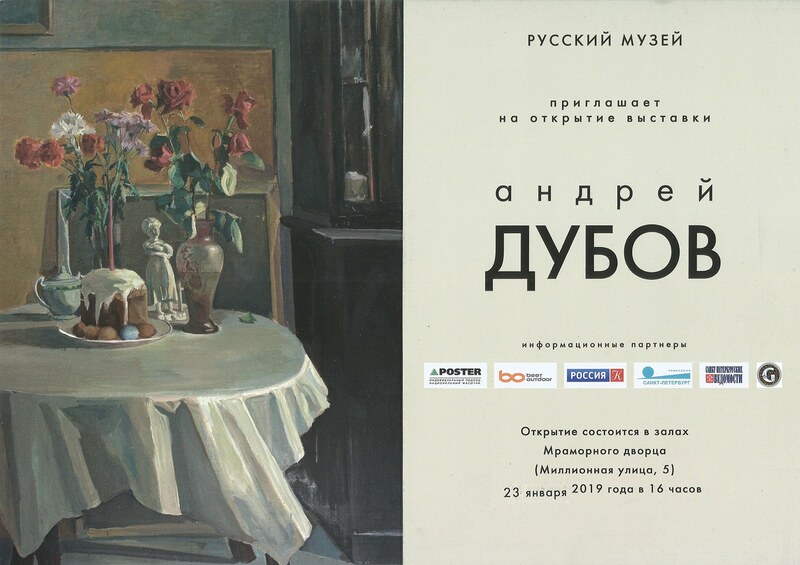 In St. Petersburg, in the Russian Museum (halls of the Marble Palace) from January 23, 2019 to March 8, 2019, a personal exhibition will take place of Andrei Igorevich, Honored Artist of the Russian Federation, corresponding member of the Russian Academy of Arts, member of the MOSKh board. The exhibition will feature works by the artist from the 80s to the 90s to the early 2000s. The exhibition includes 85 works. These are landscapes, still lifes, genre paintings, portraits. The paintings of Andrey Dubov possess qualities rare for contemporary works of art, namely, integrity and organicity, attentiveness to the color tone and accuracy of color solutions, compositional unity and special thoughtful humanity. The picturesque manner of A. Dubov is not striking, but in a special way attractive and recognizable. In the professional development of the artist, the main role was played by his first teacher - the famous Moscow painter, teacher of the Moscow Polygraphic Institute Andrei Vasnetsov. The artist Andrey Dubov, following the fundamental traditions, creates his own pictorial style. In his paintings, subjective, personally perceived Time is closely connected with Space, as well as with the fabric itself of painting, which builds this space on the canvas in accordance with the artist’s intention, striving to transform the chaos of random impressions and impulses of the surrounding world into a thoughtful and, most importantly, felt composition. Andrey Dubov is an artist who has his own view, his own deep philosophy, an artist who poses complex painterly tasks and who is able to find their expressive solutions. Without a doubt, A. Dubov is an artist of the new time, which is why his works are so interesting for the viewer. The inauguration of the exhibition “Andrey Dubov” will take place on January 23, 2019 in the Russian Museum in the halls of the Marble Palace at the address: St. Petersburg, Millionnaya St., 5. The event starts at 16-00. In the opening program of the exhibition there is an official (solemn) part and a buffet table.